Conflict-Free Canadian Diamonds - Leber Jeweler Inc.
At Leber Jeweler, we offer a wide array of Canadian conflict-free diamonds in all shapes and sizes, suitable for any budget or lifestyle. We practice some of the highest sourcing standards in the industry, offering conflict-free diamonds mined in Canada’s Northwest Territories as our way to ensure your special diamond did not fund any of the abuse or violence too often tied to this rare and highly coveted gem. 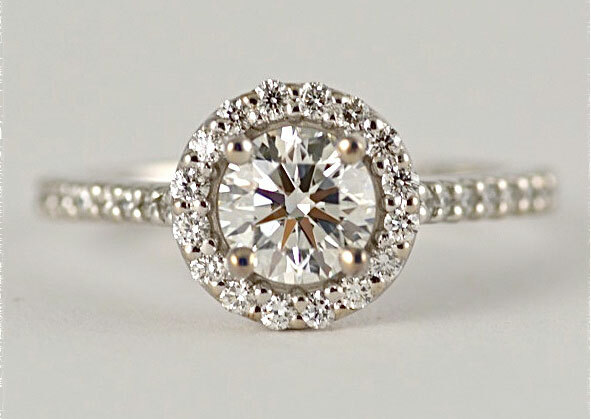 Contact us for an in-store diamond engagement ring consultation. We’d be happy to guide you in selecting a conflict-free Canadian diamond or fair trade colored gemstone engagement ring. Experience the rings in our Earthwise Jewelry® Collection in person and get professional advice regarding the entire engagement ring buying process. We’d be happy to sit down with you in our Chicago showroom and talk. Not in town? No problem! We can assist you through email and/or phone. Learn more about a design in the Earthwise Jewelry® Collection, ask questions about creating a custom design, or purchase a complete Canadian diamond engagement ring crafted especially for you in our Chicago workshop. Feel free to contact us via telephone or email for additional information. For more information about conflict-free Canadian diamonds, click here for details.